“Raleigh-Durham” redirects here. For the airport, see Raleigh-Durham International Airport. The Research Triangle, also known as Raleigh-Durham and commonly referred to as simply "The Triangle", is a region in the Piedmont of North Carolina in the United States, anchored by North Carolina State University, Duke University, University of North Carolina at Chapel Hill, and cities of Raleigh, Durham, and Chapel Hill respectively. The eight-county region, officially named the Raleigh-Durham-Cary CSA, comprises the Raleigh-Cary and Durham-Chapel Hill metropolitan areas and the Dunn Micropolitan Statistical Area. A 2009 Census Estimate put the population at 1,742,816. The Raleigh-Durham television market includes a broader 23-county area which includes Fayetteville, and has a population of 2,726,000 persons. The "Triangle" name was cemented in the public consciousness in the 1950s with the creation of Research Triangle Park, home to numerous high-tech companies and enterprises. Although the name is now used to refer to the geographic region, "The Triangle" originally referred to the universities, whose research facilities, and the educated workforce they provide, have historically served as a major attraction for businesses located in the region. The region should not be confused with "The Triad", which is a North Carolina region adjacent to and directly west of the Triangle comprising Greensboro, Winston-Salem, and High Point, among other cities. Most of the Triangle is represented by, and closely associated with, the second, fourth and thirteenth congressional districts. Depending on which definition of the Research Triangle region is used, as few as three or as many as 13 counties are included as part of the region. All of these counties when included hold a population of over 2,167,000 people. * - Most restrictive definition, including only the main counties of Wake, Durham, and Orange. The Triangle region, as defined for statistical purposes as the Raleigh-Durham-Cary CSA, comprises 8 counties, although the U.S. Census Bureau divided the region into two metropolitan statistical areas and one micropolitan area in 2003. Some local television networks define the region as Raleigh-Durham-Fayetteville. Although Fayetteville, North Carolina, is nearly 50 miles (80 km) from Raleigh's city limits, it is in the designated market area. Public secondary education in the Triangle is similar to that of the majority of the state of North Carolina, in which there are county-wide school systems (the exception is Chapel Hill-Carrboro City Schools within Orange County but apart from Orange County Schools). The Wake County Public School System, which includes the cities of Raleigh and Cary, is the largest school system in the state of North Carolina and the 18th largest in the United States, officially recording an enrollment of 139,599 students on the 20th day of the 2009-10 school year. Other larger systems in the region include Durham Public Schools (about 33,000 students) and rapidly growing Johnston County Schools (about 31,000 students). With the significant number of universities and colleges in the area and the relative absence of major league professional sports, NCAA sports are very popular, particularly those sports in which the Atlantic Coast Conference excels, most notably basketball, football, and soccer. 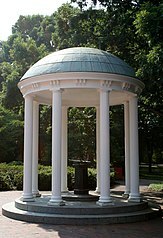 The University of North Carolina at Chapel Hill Tar Heels in Chapel Hill, North Carolina State University Wolfpack in Raleigh, and the Duke University Blue Devils in Durham are all members of the ACC. Rivalries among these schools are very strong, fueled by proximity to each other, with annual competitions in every sport. Adding to the rivalries is the large number of graduates that high schools in the region send to each of the local universities. It is very common for students at one university to know many students attending the other local universities, which increases the opportunities for "bragging" among the schools. The four ACC schools in the state, Duke, North Carolina, North Carolina State, and Wake Forest University are referred to as Tobacco Road by sportscasters, particularly in basketball. All four teams consistently produce high-caliber teams. Each of the Triangle-based universities listed have won at least two NCAA Basketball National Championships. Three historically black colleges, including new Division I member North Carolina Central University and Division II members St. Augustine College and Shaw University also boost the popularity of college sports in the region. The region has only one professional team of the four major sports, the Carolina Hurricanes of the NHL, based in Raleigh. Since moving to the Research Triangle region from Hartford, Connecticut, they have enjoyed great success, including winning a Stanley Cup and advancing to the Eastern Conference Finals. With only one top level professional sports option, minor league baseball and other sports are quite popular in the region. The Durham Bulls in Downtown Durham are a AAA Minor League Baseball affiliate of the Tampa Bay Rays, and the Carolina Mudcats, based in Zebulon, 10 miles east of Raleigh, are a AA affiliate of the Cincinnati Reds. In Cary, the Carolina RailHawks play in the second-level North American Soccer League (not to be confused with the former league of the same name). The area also had a team in the fledgling World League of American Football - however, the Raleigh-Durham Skyhawks, coached by Roman Gabriel, didn't exactly cover themselves in glory; they lost all ten games of their inaugural (and only) season in 1991. The team folded after that, being replaced in the league by the Ohio Glory, who fared little better at 1-9, ultimately suffering the same fate - along with the other 6 teams based in North America - when the league took a 2-year hiatus, returning as a 6-team all-European league in 1995. Anchored by leading technology firms, government and world-class universities and medical centers, the area's economy has performed exceptionally well. Significant increases in employment, earnings, personal income and retail sales are projected over the next 15 years. The region's growing high-technology community includes such companies as IBM, SAS Institute, Cisco Systems, NetApp and Credit Suisse First Boston. In addition to high-tech, the region is consistently ranked in the top three in the U.S. with concentration in life science companies. Some of these companies include GlaxoSmithKline, Biogen Idec, BASF, Merck & Co., Novo Nordisk, Novozymes, and Wyeth. Research Triangle Park and North Carolina State University's Centennial Campus in Raleigh support innovation through R&D and technology transfer among the region's companies and research universities (including Duke University and The University of North Carolina at Chapel Hill). The area has fared relatively well in during the Late-2000s recession ranked as the strongest region in North Carolina by the Brookings Institution and among the top 40 in the country. The change in employment during from 2008 to 2009 was 4.6% and home prices was 2%. The Greensboro metropolitan area was listed among the second weakest and the Charlotte area among the middle in the country. Duke University Medical Center Patient Rapid Transit monorail train in Durham. North Carolina Memorial and Children's hospitals in Chapel Hill. Durham VA Medical Center in Durham. The Durham Freeway passing through downtown Durham. The Triangle is served by three major interstate highways: I-40, I-85, and I-95, their spurs: I-440 and I-540, and seven U.S. Routes: 1, 64, 70, 264, 401, and 15 and 501 which are multiplexed through much of the region as US 15-501. Two of the three interstates diverge from one another in Orange County with I-85 heading northeast through northern Durham County toward Virginia, while I-40 travels southeast through southern Durham, through the center of the region, and serves as the primary freeway through Raleigh. The related loop freeways I-440 and I-540 are primarily located in Wake County around Raleigh. I-440 begins at the interchange of US 1 and I-40 southwest of downtown Raleigh and arcs northward around downtown with the formal designation as the Cliff Benson/Raleigh Beltline (co-signed with US 1 on three-fourths of its northern route) and ends at its junction with I-40 in southeast Raleigh. I-540 has about a third of its route open, but is already sometimes known as the Raleigh Outer Loop. The latest segment of 540 to open has been designated as a state route (NC 540) and not an interstate route, in anticipation of that segment eventually becoming a toll road. The 540 freeway currently serves the southernmost part of Research Triangle Park, Raleigh-Durham International Airport, North Raleigh and city's nearby northern suburbs before ending in east Raleigh at the US 64-264 Bypass. I-95 serves the extreme eastern edge of the region, crossing south-to-north through suburban Johnston County. U.S. Routes 1, 15, and 64 primarily serve the region as limited-access freeways or multi-lane highways with access roads. US 1 enters the region from the southwest as the Claude E. Pope Memorial Highway and travels through suburban Apex where it merges with US 64 and continues northeast toward Raleigh. The two highways are co-designated for about 2 miles (3.2 km) until US 1 joins I-440 and US 64 with I-40 along the Raleigh-Cary border. Capital Boulevard, which is designated US 1 for half of its route and US 401 the other is not a limited-access freeway, although it is a major thoroughfare through northeast Raleigh and into the northern downtown area. North Carolina Highway 147, also known as the Durham Freeway, is a limited-access freeway that connects I-85 with I-40 in southeastern Durham County. The four-lane route traverses downtown Durham and extends through Research Triangle Park. The freeway is often used as a detour alternate route for I-40 in the Chapel Hill area, in cases of traffic accident, congestion or road construction delays. A partnering system of multiple public transportation agencies currently serves the Triangle region. Raleigh is served by the Capital Area Transit (CAT) municipal transit system, while Durham has the Durham Area Transit Authority (DATA) system. Chapel Hill is served by Chapel Hill Transit, and Cary is also served by its own public transit systems. However, Triangle Transit, formerly called the Triangle Transit Authority (TTA), works in cooperation with all area transit systems by offering transfers between its own routes and those of the other systems. Triangle Transit also coordinates an extensive vanpool and rideshare program that serves the region's larger employers and commute destinations. There are plans to merge all of the area's municipal systems into Triangle Transit, and Triangle Transit also has proposed a regional rail system to connect downtown Durham and downtown Raleigh with multiple suburban stops as well as stops in the Research Triangle Park area. The agency's initial proposal was effectively cancelled in 2006, however, when the agency could not procure adequate federal funding. A committee of local business, transportation and government leaders currently are working with Triangle Transit to develop a new transit blueprint for the region, with various modes of rail transit, as well as bus rapid transit, open as options for consideration. American Airlines Boeing 777 touches down at RDU. Southwest Airlines jet landing at RDU. The General Assembly of North Carolina chartered the Raleigh-Durham Aeronautical Authority in 1939, which would be changed in 1945 to the Raleigh-Durham Airport Authority. The first new terminal opened in 1955. Terminal A (now Terminal 1) opened in 1981. American Airlines began service to RDU in 1985. In 1996, American Airlines ceased its hub operations at RDU due to Pan Am and Eastern Airlines. Pan Am and Eastern were Miami's main tenants until 1991, when both carriers went bankrupt. Their hubs at MIA were taken over by United Airlines and American Airlines. This created a difficulty in competing with US Airways' hub in Charlotte and Delta Air Lines' hub in Atlanta for passengers traveling between smaller cities in the North and South. Midway Airlines entered the market, starting service in 1995 with the then somewhat novel concept of 50 seat CRJs providing service from its RDU hub primarily along the east coast. Midway, originally incorporated in Chicago, had some success after moving its operations to the midpoint of the eastern United States at RDU and its headquarters to Morrisville, NC. The carrier ultimately couldn't overcome three weighty challenges: the arrival of Southwest Airlines, the refusal of American Airlines to renew the frequent flyer affiliation it had with Midway (thus dispatching numerous higher fare paying businesspeople to airlines with better reward destinations), and the significant blow of September 11, 2001. Midway Airlines filed Chapter 11 bankruptcy on August 13, 2001 and ceased operations entirely on October 30, 2003. In February 2000, RDU was ranked as the nation's second fastest growing major airport in the United States, by Airports Council International, based on 1999 statistics. Passenger growth hit 24% over the previous year, ranking RDU second only to Washington Dulles International Airport. RDU opened Terminal A south concourse for use by Northwest and Continental Airlines in 2001. The addition added 46,000 square feet (4,300 m2) and five aircraft gates to the terminal. Terminal A became designated as Terminal 1 on October 26, 2008. In 2003, RDU also dedicated a new general aviation (GA) terminal. RDU continues to keep pace with its growth by redeveloping Terminal C into a new state-of the-art terminal, now known as Terminal 2, which opened in October 2008. America West (merged with US Airways in 2005) began service at RDU in 2002 with flights to Phoenix and Las Vegas. The area is part of the Raleigh-Durham-Fayetteville television designated media area and is the 25th largest in the country with 1,131,310 households included in that area. It is part of the Raleigh-Durham Arbitron radio market (code 115) and is the 42nd largest in the country with a population of 1,365,900. Offices of The Herald-Sun in Durham. The News & Observer, the major daily Raleigh newspaper and the region's largest, with a significant regional and statewide readership (especially to the east of the Triangle). The Herald-Sun, the major daily Durham newspaper. The Durham News, a weekly community newspaper serving Durham County. The Cary News, a weekly community newspaper serving suburban Cary and western Wake County. Garner News, the weekly community newspaper for suburban Garner in southern Wake County. The Apex Herald, the weekly community newspaper for suburban Apex in western Wake County. Holly Springs Sun, the weekly community newspaper for suburban Holly Springs in southwestern Wake County. Butner-Creedmoor News The Weekly community newspaper for southern Granville County and surrounding areas. Cleveland Post, the weekly community newspaper for suburban Cleveland and nearby northwestern Johnston and southern Wake counties. Fuquay-Varina Independent, the weekly community newspaper for suburban Fuquay-Varina in southwestern Wake County. The Wake Weekly, a weekly community newspaper serving suburban Wake Forest, northern Wake County and southern Franklin County. The Chatham Journal, the weekly community newspaper for suburban Pittsboro and surrounding Chatham County. The Clayton News-Star, a weekly community newspaper for suburban Clayton and western Johnston County. The Daily Record, the daily community newspaper for suburban Dunn and surrounding Harnett County. The Courier-Times, the semiweekly community newspaper for suburban Roxboro and Person County. The Triangle Business Journal, a weekly regional economic journal. Chapel Hill Magazine, a local bi-monthly magazine that serves 12,500 households and 1,600 businesses of Chapel Hill, Carrboro, Hillsborough and northern Chatham County. The Independent Weekly, a free weekly regional independent journal published in Durham. The Carolina Journal, a monthly free regional newspaper published in Raleigh. The Raleigh Downtowner, a free monthly magazine for downtown Raleigh and environs. The Raleigh Hatchet, a free monthly magazine. The Daily Tar Heel, the free weekday (during the regular academic year) student newspaper at UNC-Chapel Hill. Technician, the free weekday (during the regular academic year) student newspaper at NC State University in Raleigh. 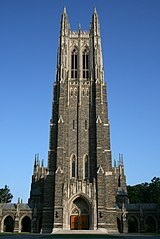 The Chronicle, a free daily newspaper for (but independent of) Duke University and its surrounding community in Durham. The Blotter, a free monthly regional literary journal. Fifteen-501, a free magazine for the Durham-Chapel Hill area (named for nearby U.S. Route 15-501). Acento Latino, a free Spanish-language weekly regional newspaper published in Raleigh. Chapel Hill News, a free Wednesday/Sunday paper, containing local content only, owned/distributed by the News/Observer. The Raleigh Telegram, a free daily news source for the greater Raleigh area. WUNC-TV (4), the PBS affiliate and viewer-supported flagship station of the University of North Carolina television network. WRAL-TV (5), the CBS affiliate, licensed to Capitol Broadcasting Company. WTVD-TV (11), the ABC affiliate, owned by ABC/Walt Disney Company. WNCN-TV (17), the NBC affiliate, owned by Media General. WLFL-TV (22), the CW affiliate, owned by Sinclair Broadcast Group. WRDC-TV (28), the My Network TV affiliate, owned by Sinclair Broadcast Group. WRAY-TV (30), an independent station, owned by Multicultural Broadcasting. WRPX-TV (47), the Pax/ION affiliate (Raleigh-Durham), owned by ION Media Networks. WRAZ-TV (50), the Fox affiliate, which is operated by Capitol Broadcasting Company. The Triangle region hosted North Carolina's first online television station, RTP-TV (Research Triangle Park Television), which broadcast news and programs of regional interest over the Internet from its Research Triangle Park location until ceasing operations in 2006. ^ "Local Governments". Research Triangle Foundation of North Carolina. 2007. http://www.rtp.org/main/index.php?pid=163&sec=3. Retrieved 2010-03-17. ^ "Triangle J History". Triangle J Council of Governments. 2008. http://www.tjcog.dst.nc.us/history.shtml. Retrieved 2010-03-17. ^ "Region/Counties Map". Research Triangle Regional Partnership. 2010. http://www.researchtriangle.org/pages.php?page1=52&page2=204&page_id=143. Retrieved 2010-03-17. ^ Snipes, Cameron (June 17, 2009). "Brookings report ranks Raleigh-Cary strongest metro in N.C.". Triangle Business Journal. http://www.bizjournals.com/triangle/stories/2009/06/15/daily31.html. Retrieved 2009-06-23. ^ "North Carolina Hospitals and Medical Centers". The Agape Center. http://theagapecenter.com/Hospitals/North-Carolina.htm. Retrieved 2008-05-30. ^ "Regional Transit Needs: Next Steps". TTA Web Site. http://www.ridetta.org/Regional_Rail/Overview/3-07LatestTransitNeeds.htm. Retrieved 2007-07-04. ^ "Local Television Market Universe Estimates". Nielson. http://www.nielsen.com/content/dam/corporate/us/en/public%20factsheets/tv/2010-2011%20DMA%20Ranks.pdf. ^ "Spring 2011 Market Survey Schedule & Population Ranking". Arbitron. http://www.arbitron.com/home/mm001050.asp. This page uses content from the English language Wikipedia. The original content was at Research Triangle. The list of authors can be seen in the page history. As with this Familypedia wiki, the content of Wikipedia is available under the Creative Commons License.